Are you in the market for some new toys for your bird pets but don’t really have the time to look for them on your own? Dr. Fox took that task for you and, after carefully examining the market and going through numerous product reviews, it was concluded that a viable choice would be the Bonka Bird Toys 1937 Bellpull. It is suitable for medium birds and, thanks to the chain-pulling effect, your bird will stay busy all day. The product also features plenty of long-lasting and beautifully colored charms. If this particular toy is not available right away, a good alternative would be the Rypet Rope Swing. You will love this toy just as much as your conure will, as it is made from plastic and metal and easy to clean. Regarding the safety of your pet bird, you should know that this toy doesn’t represent a choking hazard because the charms are large enough to prevent such a thing from happening. You can also use the perforated ball to hide small bits of food inside to stimulate the pet to do some foraging on its own. Some customers say that their small birds are pretty much intimidated with the size of the ball. A colorful toy with bell charms and a perforated ball that will entertain your pet bird. What better way for your conure to spend the day than by playing in a swing? 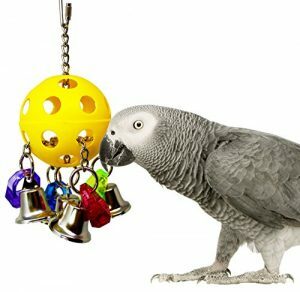 This product comes in two different styles, so you may pick the one that you think would be the most appealing for your bird, or purchase both to ensure that your pet gets as much fun and exercise as such a toy can provide. One of the styles is a wooden swing with metal chains, while the other is a colorful circle made with rope and metal. The rope swing is larger than expected, some pet bird owners comment in their reviews. 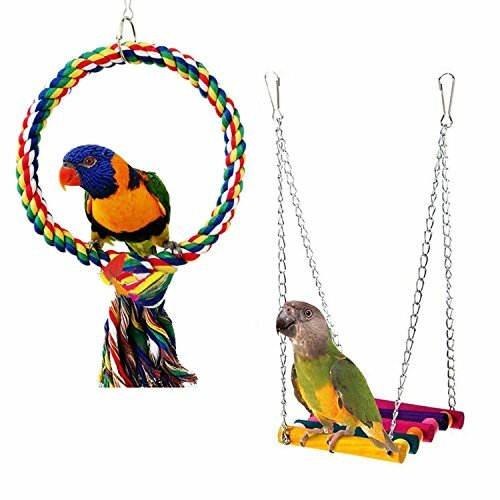 A perfect way for your conure to spend the day, swinging, in a toy that is safe and fun, at the same time. 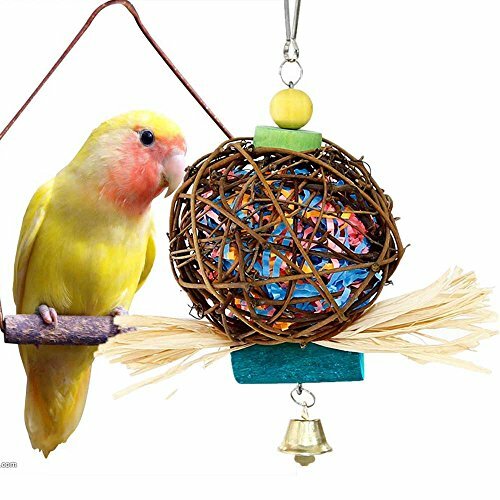 In case you are looking for something special for your pet bird, you will not go wrong with this bungee toy created to stimulate the natural acrobat in your conure. Available in two lengths, the toy can cater to birds of different sizes. The braided rope that makes the bungee toy combines beautiful colors that will make the conure take an interest in it right away. On the inside, the toy is made from a flexible wire. A strong odor is reported by some reviewers, at the moment of unpacking the toy. A customizable toy that conures will love, given that it will put the acrobats they are to the test. If you’re looking for the perfect toy for your conure, but the sheer amount of choices has you confused, then you should check out our top products below. We’ve selected some of the most popular toys so you get a unit that can offer countless fun opportunities for your pet. This item is perfect for medium-sized birds and is about 9 inches high. It is made of sturdy metal and plastic that is easy to clean. 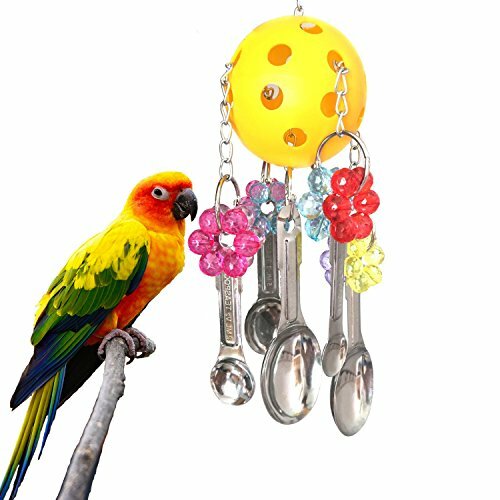 It features many hanging charms on small chains that will provide the perfect entertainment for your conure birds. The bell-shaped charms are large enough to not represent a choking hazard for your conure, while the diamond-shaped ones are made of colorful plastic and will instantly catch your bird’s attention. Also, the interior of the ball can be filled with papers or small treats for your birds to make it a great foraging toy. Keep in mind that conures need mental stimulation and what better way to provide that if not by teaching them how to procure their own fresh fruits? This toy comes with a quality link to help you easily place it in the cage. When ordering this product, don’t forget that it may arrive in various colors, not just the one shown in the images. This swing is probably one of the funniest and most exciting ways for your birds to spend their days. It is delivered in a pack of two, each product featuring a different design. There are also two style options available so you can pick the one that you like the most or purchase both the packs to offer 4 different swings for your conures. All swings are made using 100% safe, non-toxic, and durable rope, metal, and wood. Some swings come with a wood sitting toy while others feature metal chains. In addition, all swings come with fun, playful, and colorful designs that will instantly draw your bird’s attention and stimulate its imagination. The items will soothe your pet’s feet and help your bird chew, climb, swing, and play. The products can be easily installed in cages thanks to the attached steel hooks and are specifically designed for small and medium-sized birds, including parrots, conures, finches, Macaws or cockatiels. 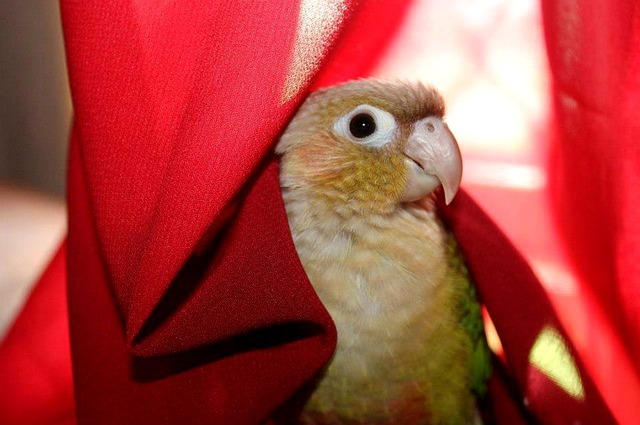 Conures are born acrobats so why not help them experiment with this side of their personality? This specific bungee toy comes in two different sizes, 63-inch long and 43-inch long and, thanks to its playful design, it will offer endless hours of fun for your pets. It is made using 100% non-toxic and non-slip cotton rope. 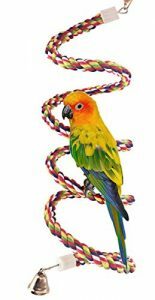 The colorful braided rope will stimulate your bird’s imagination and help it exercise more often. In addition, it is the perfect way to develop your pet’s coordination skills and work on its feet mobility and balance. The product is specifically designed for small-sized birds, including mini Macaws, some species of parrots, and conures. The bendable internal wire will help you adjust the toy’s diameter and length to perfectly match your conure’s size and needs. Most of the bird owners who purchased this item were pleased with its quality and colorful design, claiming their pets enjoyed playing with it. This toy is perfect for small and medium-sized birds and will provide endless hours of fun. The item is made of hard plastic and anti-rust, non-toxic metal, to make sure it’s safe for your birds. The design of this toy features a plastic ball with large holes that can be easily used to stack small pieces of paper or delicious treats. Attached to it you can find two different types of charms – metal spoons and colorful acrylic beads in the shape of flowers. Keep in mind that all birds love to make noises, and these metal spoons are perfect to create a musical atmosphere your pets will definitely enjoy. The possibilities are infinite with this toy but one thing is for sure – your conures will never get tired. The product comes with a convenient metal chain that allows you to hang it to your bird’s cage or place it anywhere else around the house. The item is made of rattan and natural wood and features a metal chain for increased sturdiness. The toy is made of 100% natural and non-toxic materials and is specifically designed to reduce aggression and loneliness for birds of all ages and sizes. It doesn’t contain any plastic parts or glue which makes it safe for chewing. The colorful design will certainly attract your conure’s attention, providing it endless hours of fun. Also, keep in mind that the top accessories are made of wood and their color may differ from the one shown in pictures. The interior of the rattan ball cage can be filled with small pieces of paper or your bird’s favorite treats. This way you will stimulate your pet’s mind, helping it focus on how to get to all the food inside. In time, your bird will develop healthier chewing habits and be less destructive with other items around your house. Finding the best conure toys could prove quite the struggle, especially since there are so many options available for sale. Nevertheless, if you want to make sure you chose the coolest and funniest parakeet toys, here are some useful features to help you with your search. There are plenty of materials used to manufacture good conure toys, so you just have to choose the ones that you think are the most suitable for your bird. Toys can be made of plastic, metal, wood, rattan or cotton strings. Keep in mind that your little bird loves to chew so you should probably stick to resistant materials if you don’t want to replace the toys every other week. No matter your choice of materials, make sure you opt for safe and non-toxic bird toys. This means you should stay away from chemical dyes, glue or small parts that might represent a choking hazard. However, not all woods are safe for your conure’s health. Basswood, pine, cactus, apple, maple or walnut are considered safe woods, while others like oak, red cherry or cedar may be dangerous. Pressure-treated wood is often infused with arsenic which can cause severe health problems and even death to your bird. 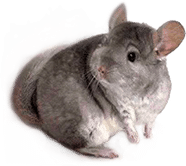 If you have trouble finding the right type of material, perhaps some online conure toys reviews from other customers will help you make up your mind easier. The best toys for conure birds will feature colorful and attractive designs, shapes, and accessories. Everything that is shiny or makes a sound will mesmerize your feathered friend and will keep it occupied for many hours. 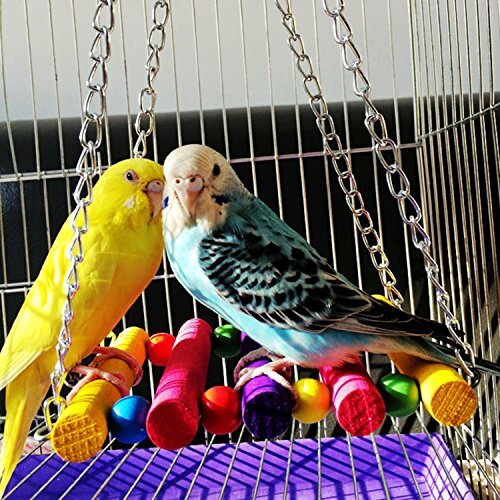 Swings probably represent one of the best choices as they can be easily attached to any type of modern new parakeet cage. They come in various shapes and sizes, so make sure to find the right one for your conure. Swings are not only good for entertaining your bird but will also provide a comfortable place for it to rest its legs. If you happen to choose large and tall bird cages for parakeets you can easily attach three-four different swings for more diversity. Stimulating or stress relief toys? Lastly, you should also consider the purpose of the toy. Some of them are specifically designed to improve your bird’s bad chewing habits and make it more disciplined, while others, on the contrary, will work on the conure’s personal development. Ropes and bungees are great for improving your bird’s balance, mobility, and coordination. Most of these ropes also come with colorful designs and are made of organic cotton, meaning your conure can safely chew on them. And, speaking of chewing, as most birds love to do this, it would be best to invest in strong and long-lasting toys to place inside the cage. Rattan and wood balls filled with a delicious and healthy parakeet food could prove a great choice to consider. Again, we strongly recommend you to check as many online reviews of toys for conure birds as possible to see the opinions of other customers.